In the Dec. 1 Kerry Conversation, former Sec. 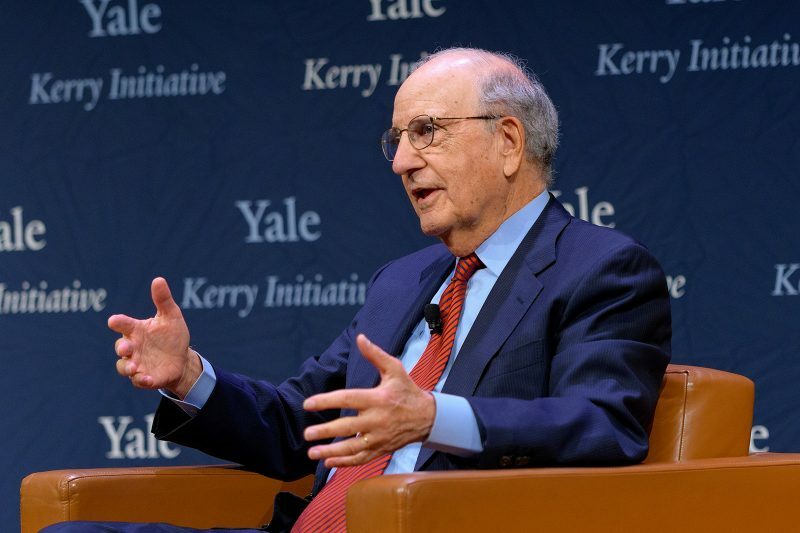 John Kerry and former Sen. George Mitchell addressed wide-ranging topics including Brexit, the Irish peace agreement, political polarization and technological innovation. The greatest threat to the U.S. today is the corrosion of our democracy from within. That was one of the insights offered by former Sen. George J. Mitchell, who served as a U.S. senator from Maine and as majority leader in the Senate. He cited hyper-partisan gerrymandering and too much money in politics as the two major reasons for gridlock in Congress and for the polarized state of the country. He pointed to the U.S. Supreme Court’s 2010 decision in the Citizens United case as a key contributing factor. Mitchell’s remarks were part of a “Kerry Conversation,” a series hosted by the Kerry Initiative at the Yale Jackson Institute for Global Affairs. The initiative, founded in 2017, is an interdisciplinary program that tackles pressing global challenges through teaching, research, and international dialogue. The December 1 conversation was held before a full house in the School of Management’s Zhang Auditorium. It was a wide-ranging discussion on U.S. and European politics, the impact of disruptive innovation and global leadership. The two reflected on the 20-year anniversary of the Irish peace agreement and offered their thoughts on the possible implications of the Brexit agreement. Mitchell cautioned against the U.K. taking any steps—such as reintroducing a hard border between the Republic of Ireland and Northern Ireland—that could disrupt the peace agreement. “The threat of violence never disappears. You can’t rule it out. Anything that risks [the peace] has to be carefully weighed,” he said. Mitchell, who spent five years helping to negotiate the peace agreement, also took part in the symposium, “Twenty Years of Peace: Progress and Possibilities in Northern Ireland,” held on November 30 at Yale. The hour-and-a-half-long discussion also touched on global trade agreements and the impact of innovation and new technologies. Mitchell underscored the idea that innovation can be good for society overall, even if detrimental to some individuals, citing the elimination of the whaling industry and stagecoach production as examples. “Those changes were the result of dynamic innovation, not trade agreements,” Mitchell said. Kerry and Mitchell also reflected on the recent passing of President George H.W. Bush, a Class of 1948 Yale alumnus. Both served in the Senate during Bush’s presidency. Kerry wrapped up the talk by encouraging audience members to exercise their right to vote, citing high voter turnout rates in other countries.